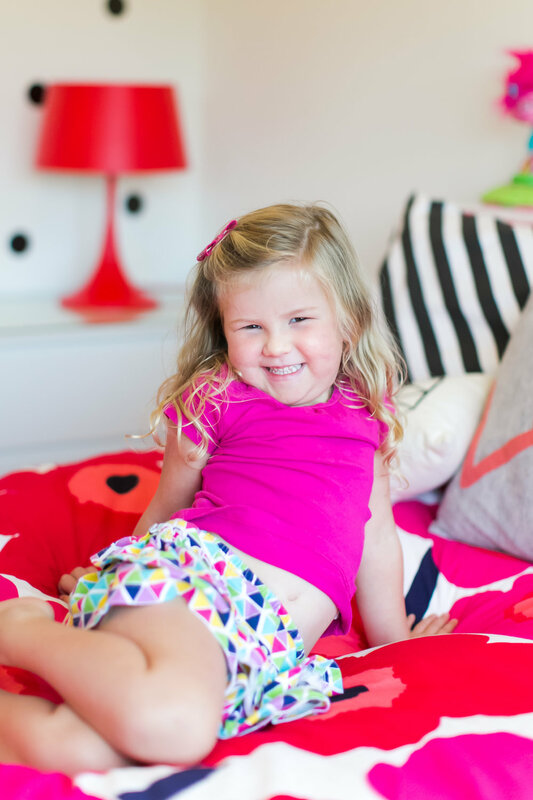 When it comes to designing a kid’s bedroom, it is so easy to walk inside your favorite children’s home furnishings store and pick a “theme,” and then buy the individual pieces to that theme; crib bumper, matching throw pillow, coordinating wall art, complimentary sheet set ALL with the same design carried throughout the items. That’s a great way to quickly design and furnish an entire room without having to put a whole lot of thought into it. However, I want to challenge your creative juices just a bit! 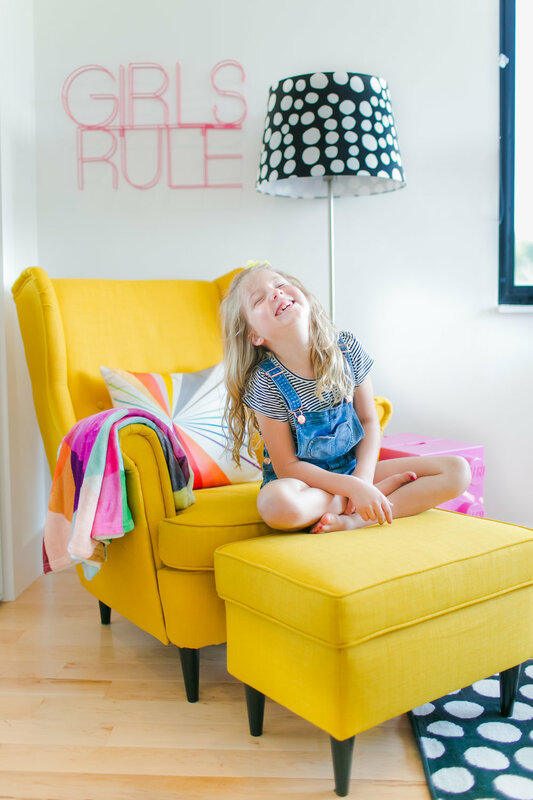 When I think about creating a cool and creative space for a child, I encourage you to think less about an age appropriate theme, but more about eclectic colors and textures that foster a child’s creativity and compliments their personalities. Not only will that save you money in the long run since he/she will never reach an age where the entire themed set of items is no longer appropriate, but rather, maybe just having to change a piece out here or there without totally dismantling the room from floor to ceiling to better suit the current age of the child. 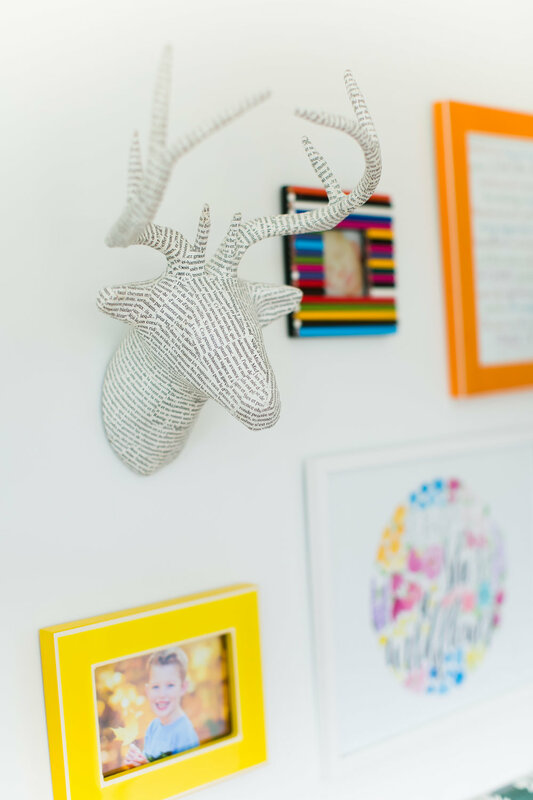 Another idea I try to abide by when decorating a kid’s room, is buying some pieces that I might use elsewhere in the home. 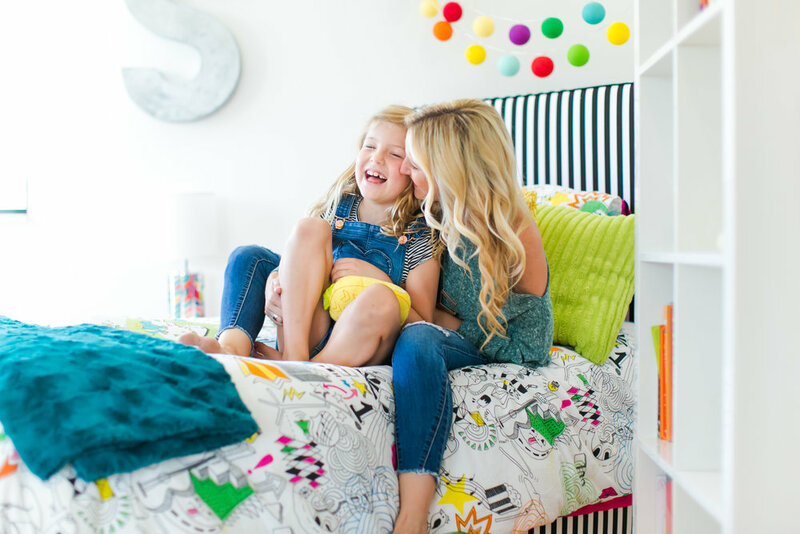 What that means is that I encourage you start looking outside of kid-designated home furnishing stores, and focus some of your efforts in stores that you’d furnish your living room or master bedroom with. Sometimes, without having to spend any money at all, it’s fun to move a few items around the house to give things a fresh, new feeling. 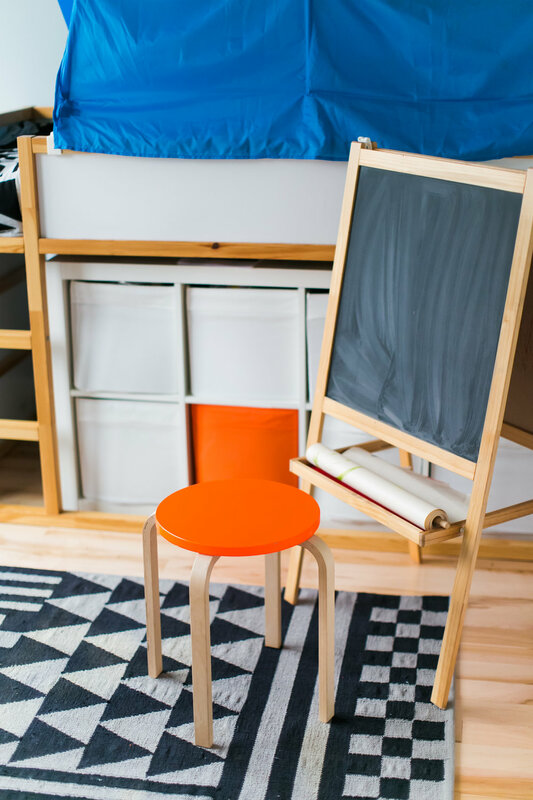 Comforters, duvets, and wall decor are great items to look for at kid stores, but perhaps think about purchasing a nightstand, throw blanket, or rug at a store you personally like. This little girl’s bedroom that I got to visit makes me wish I could sleep and play here. 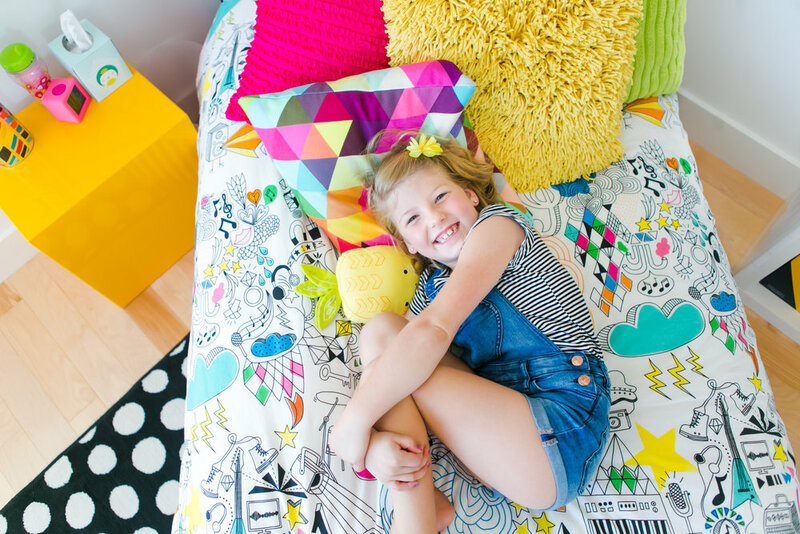 Certain items are relevant to a seven year old girl, while the majority of the decor could easily be used in other spaces of the home since it isn’t necessarily a “kid-only” decor item! Bright and colorful pieces bring this daylight-filled room to life, while offering a comfy place to sleep, and a cozy chair to curl-up with a book. 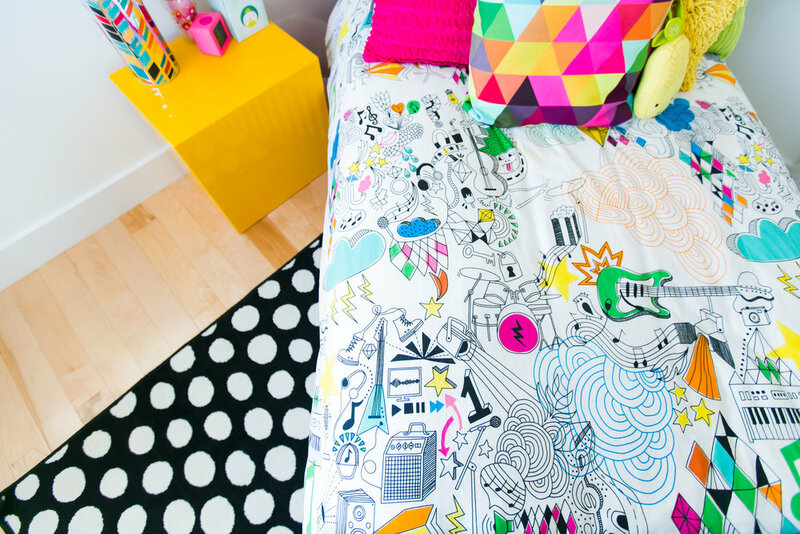 This room is another great example of using eclectic decor and contrasting colors to bring energy to a child’s room. 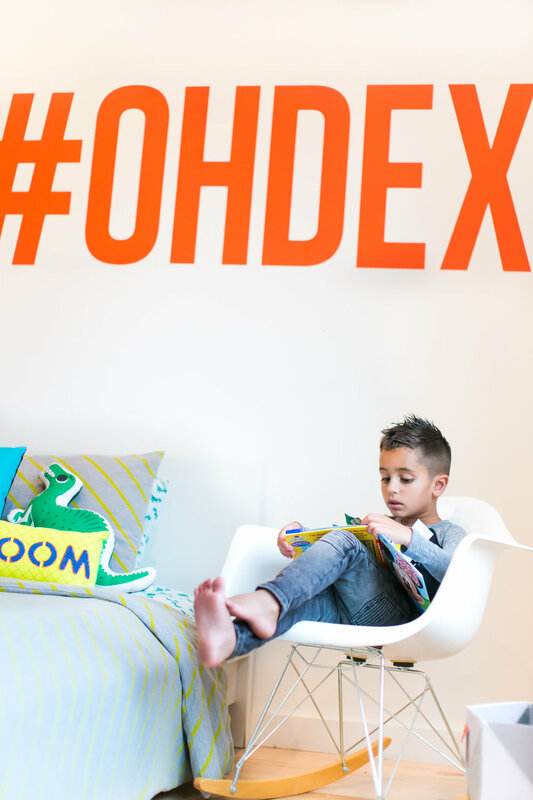 The “#OHDEX” wall vinyl in bright orange is definitely a focal point, but what I love most is that this piece is only $50, and when it’s time to change-up the decor, it peels away easily leaving the paint and drywall unharmed. Every piece of the bedding set is from The Land of Nod, however, they’re individually from different themed product lines at The Land of Nod. 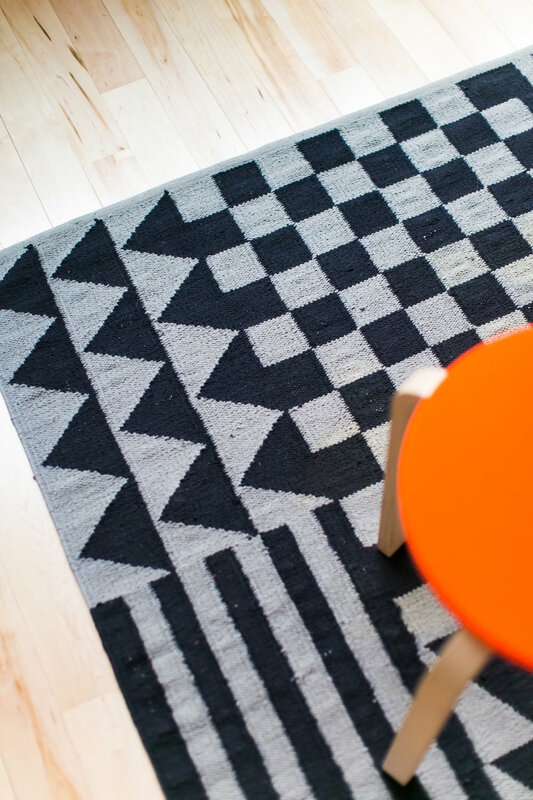 The items were picked based on a palette of contrasting shapes and colors. 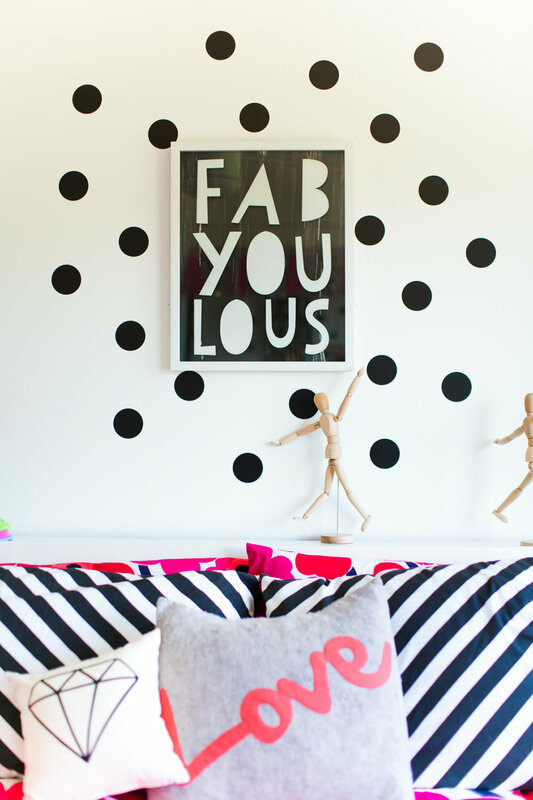 Alright, I’ll let you in on the background inspiration for this little girl’s bedroom. 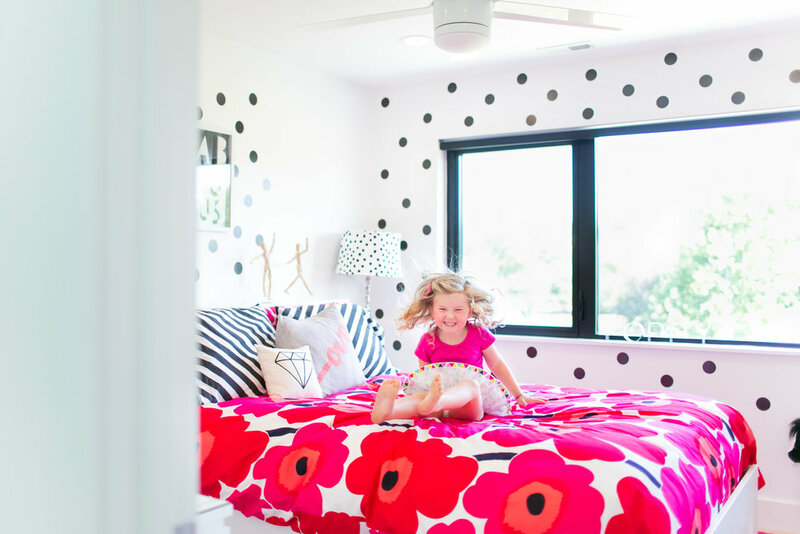 I’ll give you a hint: Her name is “Poppy,” so yes, this gorgeous Marimekko duvet was an obvious choice for a little girl with a bright and happy spirit, and for someone who's name is shared with a flower. A simple color palette of reds, pinks and purples is carried-out through this entire room. Animal busts stacked vertically on the wall not only add dimension and visual interest, but they offer the perfect amount of whimsy. 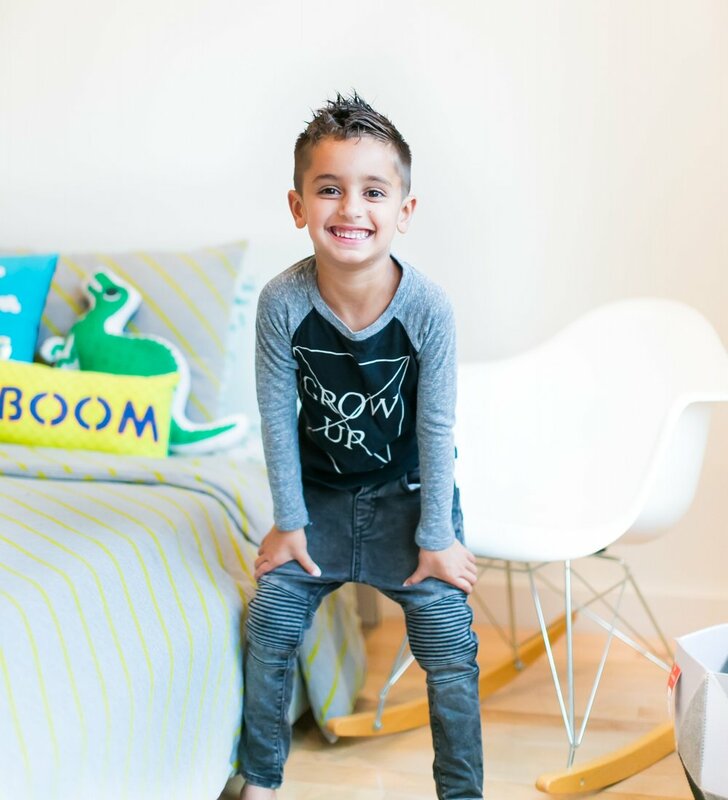 This seven year old boy’s room uses a bold cobalt blue color that was found in an accent color on his desk. That color was matched to the wall paint to tie the two sides of the room together. A little paint, a simple design and another wall vinyl spelling “HELLO.” make for a very affordable feature wall. 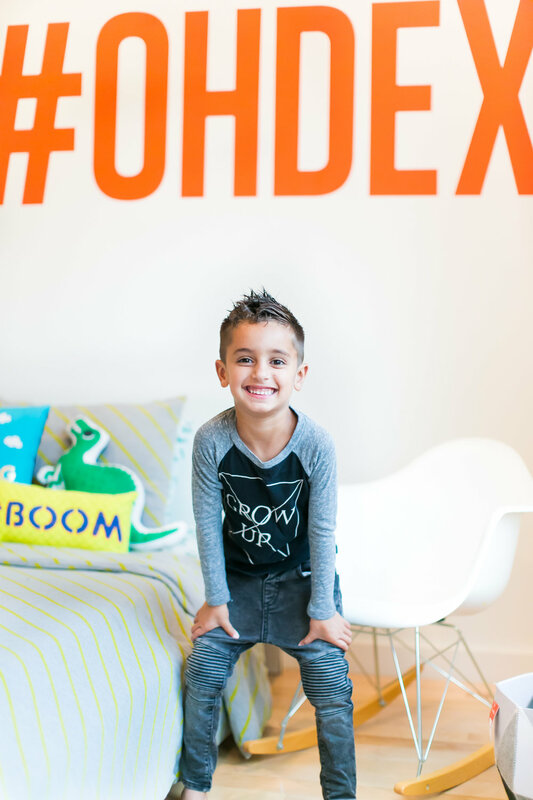 With only one other bold bright orange stool for a pop of color, the rest of the room uses greys and blacks for a masculine feel for this growing boy. 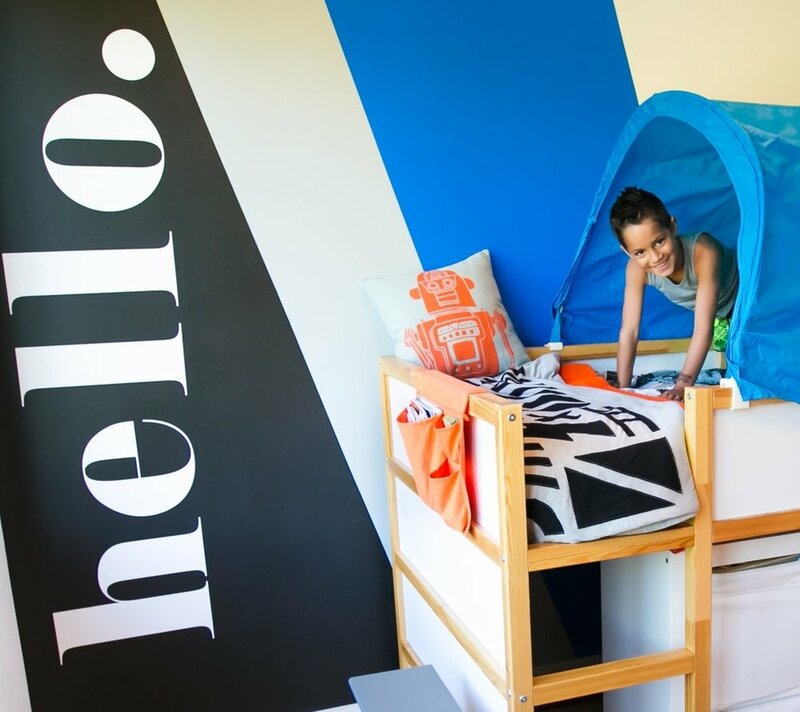 While there’s lots of floor space to play, the most popular place in this space is the fort bed! Refined Taste. Impeccable Details. Stunning Views.